MTZ Parts | MTZ Equipment Ltd.
Keep your MTZ Tractor running like new with MTZ Genuine Parts. MTZ Equipment Ltd. is the exclusive North American Distributor of Genuine Parts from the Minsk Tractors Factory. 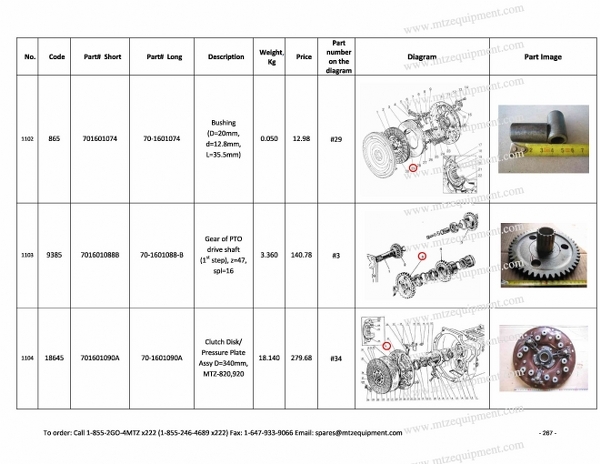 All MTZ Parts are OEM unless otherwise noted. Ray Boulanger is MTZ Parts Manager with many years of experience. He is also leading a Team in Minsk, all provide constant expertise and support to Dealers and their Customers throughout the United States and Canada. MTZ Genuine Parts are supported with a full warranty as required by local state or province regulations. Tel : 1-855 – 2GO-4MTZ (1-855-246 4689), ext. 222. It will be our pleasure to assist and connect you to a Dealer or Sales Rep. in your area. Parts are available from our extensive parts inventory positioned at Parts Warehouse Locations throughout Canada & USA.